by Uwaoma Eizu, an officer of Potters Lounge, Ikoyi. Publisher: Exòrma- published in Rome, Italy in May 2011. A book for the perfect beginning for sober reflection. The book, The Next Nehemiah, is a voyage of insightful thoughts, excellently delivered with a literal prowess flown through finds and facts. It is indeed an interesting book sure to become a classic and favorite to anyone that comes in contact with it. It delivers on its title as it sets out to rebuild minds like the classic Nehemiah, the Jewish leader and governor, historically responsible for rebuilding Jerusalem in 444 BC. Personally, I love the feel of how it welcomes us back to the future of history and those presently in the making, analytically reminding us of purpose and impact without mincing words. In alignment to the concept of the book, I believe that GOD created man; I do not believe that man’s existence is the result of some evolutionary process. Just as a watch which is intricately made, must have a watchmaker, Man, who is much more intricately made, had to have a Maker. Secondly, there’s a guideline from the most read book from our Maker, in the Bible which the writer honorably followed. 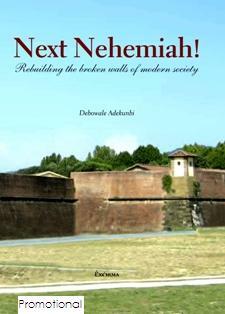 The focus of the book, The Next Nehemiah, a realistic book, talks about the ills, norms and wrongs of African and European people, recommendations and bailout clearly illustrated. A good book from Adebowale, excellent on the basis of being his first book. He delivered it excellently. This isn’t another writer trying to squeeze a nickel out of you, this book is for every home, every child, company, government, church and mosques. It is enriched with compatible quotes, real life situations and funny illustrations. 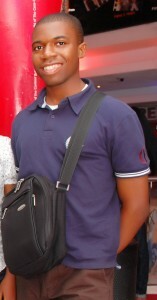 Adebowale is a gifted writer. I love his book. A book for the perfect beginning for sober reflection. The author, Adebowale Adekunbi, is a gold medalist in nonfiction writing from the Festival of Peace 2012 held at Tor Vergata, Rome this month. His writing credits include Africa News, Italy and other publications in print and online mediums in Italy and on YNaija. So far, the book has been launched in Rome, Milan and Latina. In England and Wales, it has readership of a few dozen. Though it is yet to be launched in Nigeria, the author’s visit in 2011 served as a good preliminary step. The book is on sale at Bible Wonderland, Surulere and Laterna Ventures, Victoria Island, Lagos.